This post has been featured on Serious Eats. Hey guys! What’s up? How was your Christmas? Was is crazy like mine? I hope not… The Rocking Rebel and I have both come down with the flu. Yes, on Christmas… ON CHRISTMAS! Talking about bad luck. Well, speaking of luck, the bug we caught didn’t really affect our appetite much. Which was lucky, as Christmas is all about eating, right? So after downing some aspirin to lower the fever and wrapped in all the scarves and sweaters we could find we were able to join the festivities and enjoy all the goodies Christmas had to offer this year! Which brings me to this cake! It’s a New Year’s Eve cake. It has Champagne in it! I developed the recipe for Serious Eats and it was posted on the site about a week ago. You can find the post here. 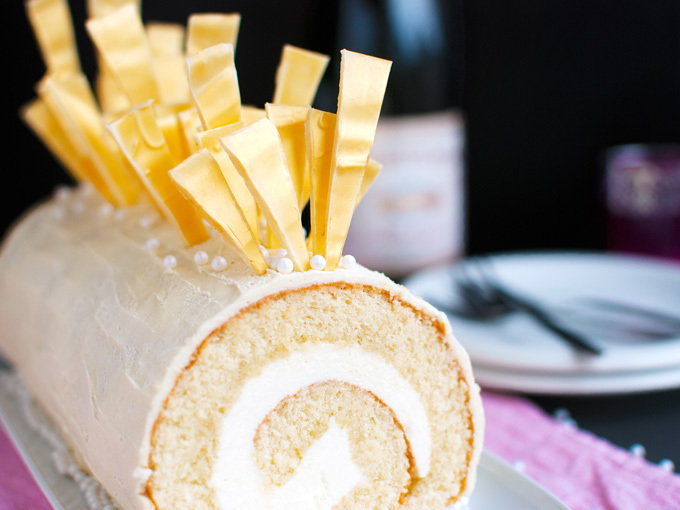 It’s basically a Champagne cake roll filled with Champagne buttercream and decorated with white chocolate ganache, gold chocolate shards and sugar pearls. It’s delicious! Even if you don’t like Champagne. Wait, what? Is there anyone out there who doesn’t like Champagne? Well, stop buying the cheap stuff then… A good Champagne is delicious! In fact, although most people drink Champagne to celebrate things, I personally think a bottle of good Champagne is cause for celebration! Needless to say, I also really love this cake. It just makes me feel so grown-up. But in a good way! Probably because of its intense Champagne flavor. And yet there’s not a drop of Champagne in this recipe. Confused yet? A few years ago, a pastry chef taught me how to make delicious Champagne flavored cakes and desserts. His top tip was to use Marc de Champagne instead of actual Champagne. As you all know, Champagne is a sparkling wine produced in the Champagne region of France. Marc de Champagne is also made in Champagne, but it’s not a wine. A ‘marc’ is actually a brandy produced by distilling the grape skins, seeds and stalks that are left from the wine making process. Although it’s made from the same grapes as Champagne, Marc de Champagne is therefore a lot sweeter than Champagne, with a more intense flavor. Which makes it a perfect to use in sweet dessert recipes! In this recipe, Marc de Champagne is added to the cake batter, to the buttercream filling and to the simple syrup used to imbibe the cake with. Unfortunately, Marc de Champagne can be hard to come by. Plus, it can be really expensive. Lucky for us, there are cheaper options! Although I’m sure wine connoisseurs will be able to tell the difference – they might even hate me for even suggesting this – those of use who don’t have a sommelier’s palate can also use a Marc de Bourgogne or a barrel-aged grappa made with Chardonnay grapes instead of Marc de Champagne. Both impart similar flavors to the cake as Marc de Champagne, but are a lot cheaper because they’re not from the popular Champagne region. Like Marc de Champagne, Marc de Bourgogne is a marc, made from the skins, seeds and stalks of one of the grapes also used to make Champagne. Grappa is the Italian version of the French marcs; it is also made by distilling grape skins, seeds and stalks. However, unlike the French marcs, it’s more widely available. More often than not, you can even buy smaller bottles of it, which is great if you’re only going to use it in dessert recipes like this one! By using a barrel-aged grappa made from the same grapes that are used to make Champagne (chardonnay grapes mostly), you can get that great Marc de Champagne flavor without having to spend too much money. Like I said, the marcs and grappa are a lot more intense. So either use real Marc de Champagne, the cheaper Marc de Bourgogne, or a barrel-aged grappa made with Chardonnay grapes for this recipe. 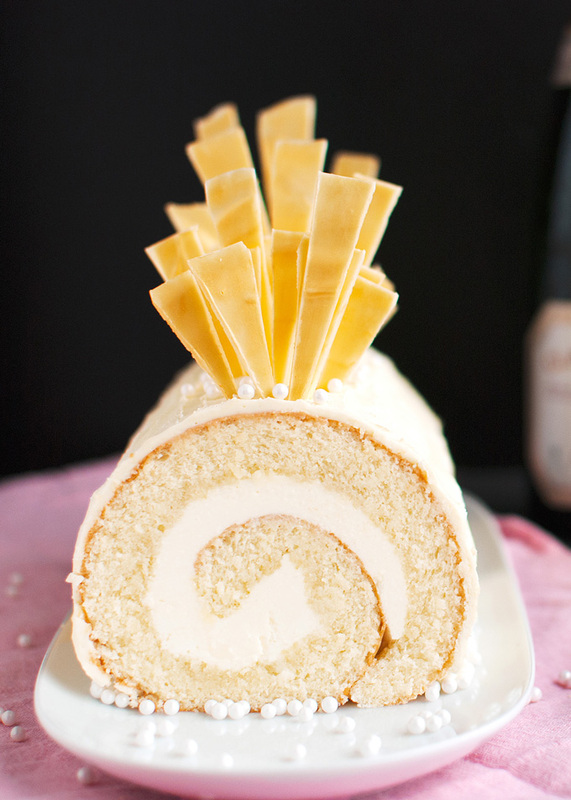 So let’s move on to the cake roll. The cake I use in this recipe is really easy to make. You beat eggs for a good five minutes, until they’ve tripled in size and kind of look like batter all by themselves. You then mix in sugar, oil and buttermilk for a moist, tender crumb and some flour, baking powder and salt. Easy, right? You’ll have the cake baking in the oven before you know it. There’s nothing to it! It’s not until the cake comes out of the oven that you need to start paying attention. The cake doesn’t take very long to bake, so the first thing you want to do once the cake is in the oven, is tidy up your workspace and place a clean, cotton tea towel on top of your counter. 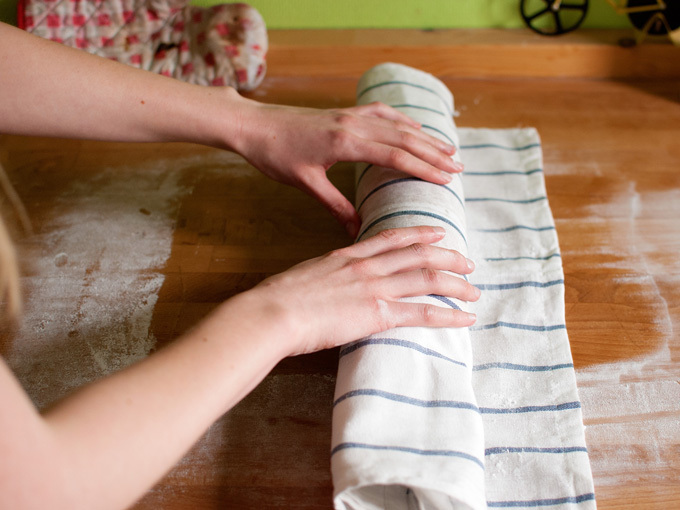 Make sure the tea towel does not smell too strongly of laundry detergent and that it doesn’t have a clear waffle pattern or any textural embellishments, as these can make the rolled cake stick to the tea towel. 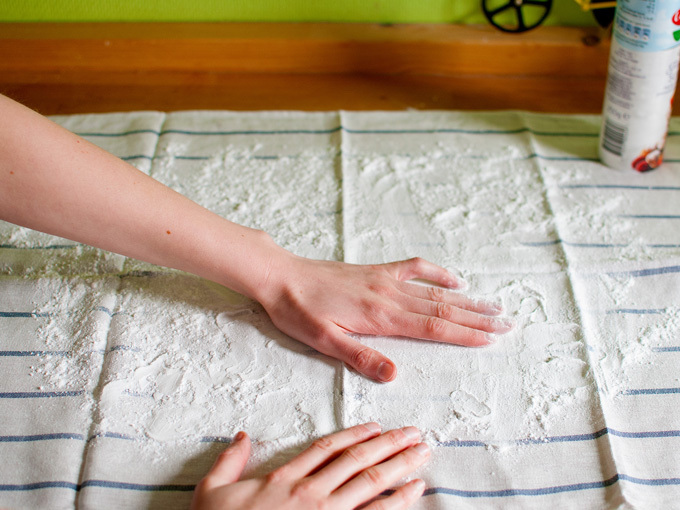 Dust the tea towel generously with powdered sugar, using your hands to rub the sugar into the fabric. The powdered sugar keeps the cake from absorbing too much steam as it cools and imparts an added sweetness to the outer side of the cake roll. Don’t worry about the inner side of the cake roll lacking sweetness; the cake is actually delicious on its own and once the cake has cooled, the inner crust is imbibed with Champagne syrup. Once the cake is done, remove it from the oven and allow it to cool for one to two minutes in the pan before turning it out onto the sugared tea towel and carefully peeling off the baking parchment. Once you’ve peeled off the baking parchment, immediately start rolling the cake in a tight roll, starting at one of the shorter ends. Roll tightly, making sure to apply even pressure as you roll. Once rolled, place the cake seam-side down onto a wire rack to cool to room temperature. This may take up to two hours, depending on where you leave it to cool. I placed in on the balcony, where it’s nice and chilly this time of the year. 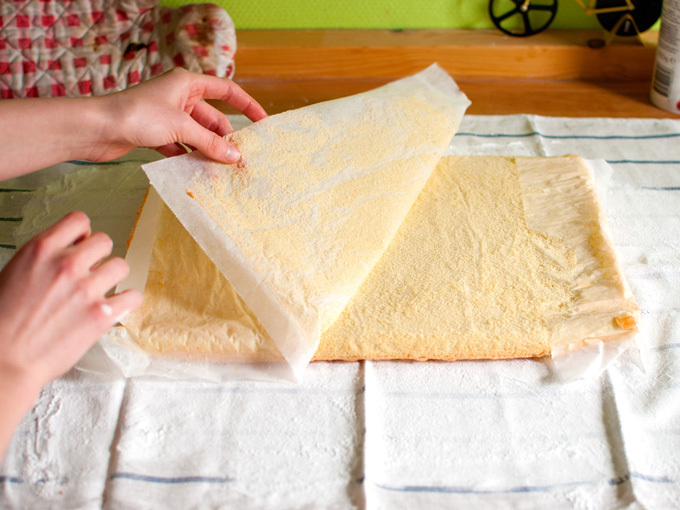 Once the cake has cooled to room temperature, unroll it carefully. You don’t want it to crack or stick to the tea towel. The unrolled cake will roll back in a bit, but that’s fine. Don’t force the curled end down, or you’ll risk cracking the cake. Should you accidentally crack the cake a little, don’t worry about it. Once the cake roll is filled and coated with the white chocolate ganache, no one will be able to tell! Before filling the cake with Champage buttercream, you need to imbibe it with a simple syrup mixed with a little Marc de Champagne. To make the syrup, you start by combining equal amounts of sugar and water in a small saucepan. Heat the mixture over low heat, stirring until the sugar has dissolved and the syrup is clear. That’s it! You don’t even need to bring the mixture to a boil. It’s really just a matter of dissolving sugar in water. Once the syrup has cooled to room temperature, add a teaspoon of Marc de Champagne and you’re done! 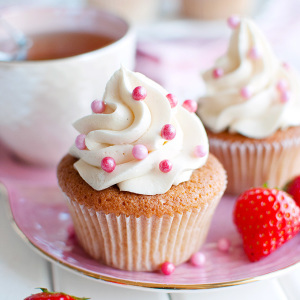 By the way, I love imbibing cakes with simple syrups! Laced with liqueur or mixed with a little fruit juice, they impart incredible flavor while adding moisture at the same time. In this cake, the Champagne syrup really brings out the Champagne flavor of the buttercream. Without the syrup, I think the flavor of the white chocolate coating can easily overpower the delicate Champagne notes of the buttercream, so make sure to add it. It’s amazing! Anyway, once you’ve brushed the inside of the cake roll with the Champagne syrup, you need to fill it with the buttercream. I use Swiss buttercream to fill this cake. Swiss buttercream is made with Swiss meringue, which in turn is made by dissolving sugar into egg whites and whipping the mixture until it holds stiff peaks. Cubes of softened butter are then mixed into the meringue to turn it into buttercream. Swiss buttercream is notoriously finicky and tends to separate once you start mixing in the butter. Lucky for us, it’s also super easy to fix it if it does! Just keep mixing and beating with an electric mixer and the buttercream will come together again! It will first look worse, but it shouldn’t take longer than a couple of minutes before the curdled mixture magically transforms into smooth and luscious buttercream. After you’ve mixed in the butter mix in a tablespoon of Marc de Champagne. Or grappa. It’s easiest to use an offset spatula to spread the buttercream over the cake, but a simple metal spoon will work as well. Try to keep the naturally curly end of the cake (which will become the inside of the cake roll) somewhat curled as you frost it to keep it from breaking and cracking. The inner curl can be quite stubborn… Also, leave a one-inch border of uncovered cake at the other short end of the cake (the side that doesn’t curl after you’ve unrolled the cake). This makes for a cleaner seam. Once you’ve filled the cake, reroll it tightly and place it seam-side down onto a wire rack set over a rimmed cookie sheet or baking sheet. Coat the cake with a thin layer of whipped white chocolate ganache (the cookie sheet will catch any drips), using the back of a spoon to create a bark-like pattern, and place it in the fridge until the ganache has set. That’s most of the work done! If you’re lazy or just don’t feel like making white chocolate shards, just serve the cake roll as is. It will still look very pretty. Or use a clean, dry paintbrush to dust it with gold luster dust. Or dust it with non-melting topping sugar instead to make it look like a snowy log. 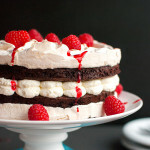 Or just top with a few cake sparklers and dim the lights before serving. It’s your cake, so feel free to decorate it however which way you like! As much as I love the idea of cake sparklers, I prefer the white chocolate shards. They look kind of dangerous and sharp. My rocking rebel boyfriend even thinks the chocolate shards make the cake kind of look like the tip of a dragon’s tail. I guess he’s right. The cake does kind of look like that white and gold dragon in one of the last Harry Potter movies! Anyway, here’s how you make the chocolate shards! I made the white chocolate shards the easy way, without tempering the chocolate. If you have the right tools to temper chocolate, by all means temper it first. I just melted the chocolate and spread it onto a chilled cookie sheet lined with baking parchment. I then placed it in the fridge to set before I cut it into shards and dusted it with gold luster dust. If you’ve never worked with luster dust, it’s super easy and really fun! But be warned, working with luster dust might actually give you the urge to cover everything within an arms length in the stuff. Or is that just me? Enjoy this recipe guys. See you next year! Adjust oven rack to lower position and preheat oven to 350°F. Grease a rimmed jelly roll pan with a little butter and line with baking parchment on bottom and sides. In a large bowl, beat eggs with an electric mixer until tripled in volume and lightened in color, about 5 minutes. With the mixer running, add the sugar one tablespoon at a time, mixing well after each addition. This should take about 2 minutes. Drizzle in the oil, buttermilk and Marc de Champagne and mix until incorporated. In a small bowl, stir together the flour, baking powder, and salt. Add dry ingredients to the egg mixture, one tablespoon at a time, mixing continuously until combined. Pour batter into prepared pan and carefully tilt pan to distribute batter in an even layer. Bake for until a tester inserted into the center of the cake comes out clean and top of the cake springs back when pressed with fingers, 12 to 15 minutes. 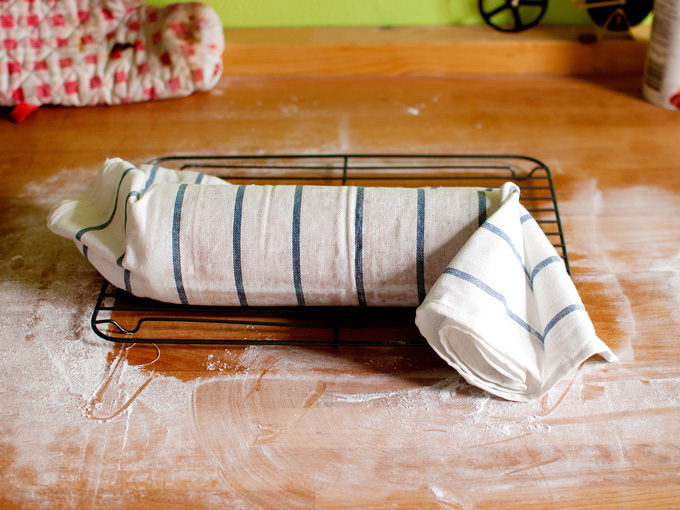 While the cake is in the oven, place a clean, cotton tea towel (preferably one without decorative textures) on counter and sprinkle with powdered sugar, using your hands to rub the sugar into the tea towel. Once the cake is done, remove from oven and allow to cool for one minute, then immediately turn cake out onto the tea towel, carefully peel off the parchment and roll cake in the tea towel, starting at a short side. Roll slowly and tightly. 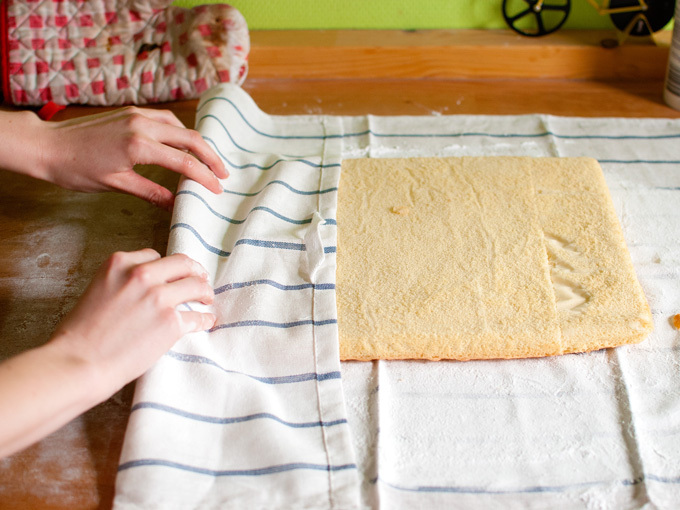 Place cake roll (wrapped in tea towel) on a wire rack seam-side down until it has cooled completely. Combine water and sugar in a small saucepan. Heat over low heat, stirring until the sugar has dissolved and the syrup is clear. Remove from heat, transfer to a mug and allow to cool. Once cool, combine ¼ cup of syrup with the Marc de Champagne (remaining syrup can be stored in a sealed container in the refrigerator for another use). In a medium-sized heatproof bowl, whisk together the egg whites and sugar. Place the bowl over a small pan with simmering water, making sure the water doesn't touch the bowl. Keep whisking the mixture until sugar has dissolved. You can easily check whether the sugar has dissolved by rubbing a bit of the mixture between your fingers; the mixture shouldn't feel grainy. If you're not worried about salmonella, you can take the mixture off the heat at this point. If you want to pasteurize the meringue, keep whisking until the mixture reaches a temperature of 71°C/160°F using a candy thermometer. Once the meringue reaches the desired temperature, take it off the heat. Using a hand held or a stand mixer, beat the warm mixture until the meringue holds stiff peaks and the bottom of the bowl feels cool to the touch. Add butter one cube at a time, beating well with the electric mixer after each addition. The mixture may start to look as if it’s separating during this process but don't panic: just keep beating and the buttercream will come together and become smooth. 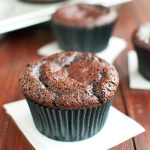 Once the buttercream is smooth and creamy, add Marc de Champagne and again mix until smooth. 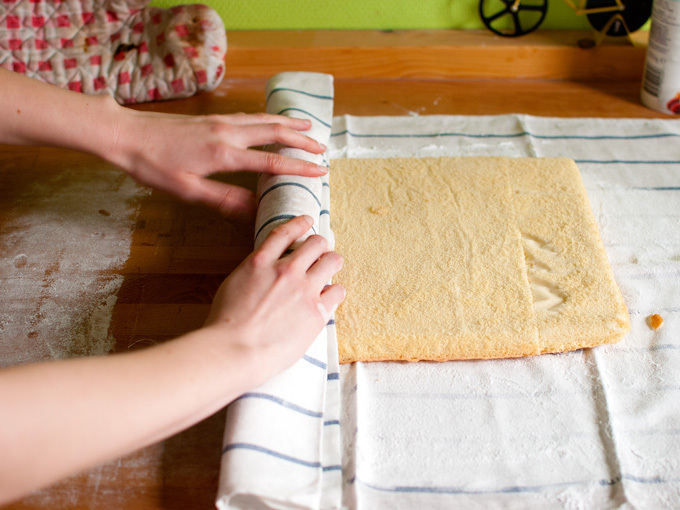 Once the cake has cooled to room temperature, carefully unroll the cake roll and place it on a clean work surface. Allow the tightest rolled end to curl back in to prevent the cake from cracking. Should it crack a little, that’s fine; you won’t see it after you roll it back up. 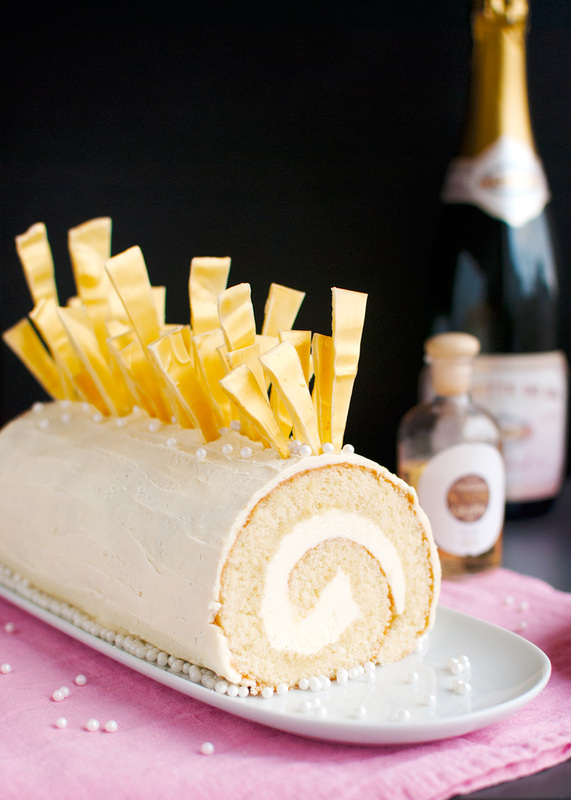 Using a pastry brush, brush the inside of the cake roll with the champagne syrup. Frost with the Champagne buttercream, leaving a one-inch border uncovered at the uncurled end. Reroll cake starting from the curled end. Combine cream and white chocolate in the bowl of a double boiler. Heat over low heat, stirring occasionally, until the chocolate has melted and the ganache is smooth. Remove from heat and allow to cool to body temperature. Once cool, beat ganache with a mixer until it lightens in color. It should be thick, but easily spreadable. Frost the cake roll with the white chocolate ganache, using the back of a spoon to create a bark-like pattern. Allow excess ganache to drip down onto the cookie sheet. Place cake (wire rack and all) in the fridge until ganache has set. Place a cookie sheet in the freezer. Carefully melt the chocolate in the bowl of a double boiler, stirring occasionally. Once the chocolate has melted, remove the cookie sheet from the freezer and line it with baking parchment. Pour the melted white chocolate onto the sheet. 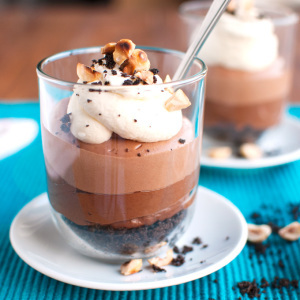 Using the back of a spoon, spread the chocolate in an even layer. Allow chocolate to set completely in the refrigerator. Once set, use a sharp knife to cut the chocolate into shards. Using a clean, dry paintbrush, brush the chocolate shards with the gold luster dust. Once the ganache has set, remove the cake from the fridge. Heat a serrated knife by placing the knife in a tall container filled with hot water. Dry the knife and trim ½ inch off both ends of the cake, wiping the knife clean between cuts. Run a sharp knife along the perimeter of the cake to loosen the ganache from the wire rack. 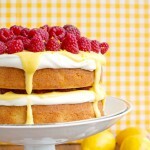 Carefully transfer the cake to a serving plate or cake stand using a large spatula. 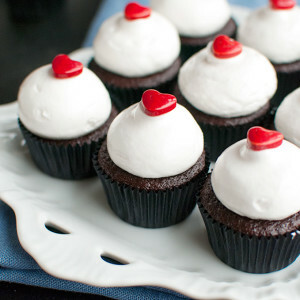 Decorate with the chocolate shards and sugar pearls as desired. Allow the cake to come to room temperate before serving. This should take 2-3 hours. Undecorated cake (finished cake roll without the chocolate shards and sugar pearls) can be stored in an airtight container in the fridge for up to two days. Decorate just before serving. To pasteurize the buttercream, you will need a candy thermometer. Also note that this cake must be served at room temperature to experience the velvety smoothness of the buttercream. 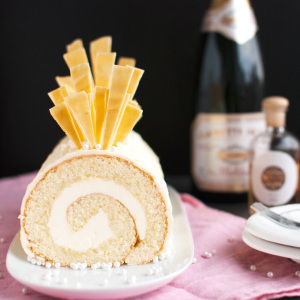 Can’t think of a better showstopping dessert for NYE than this roulade! It looks delicious and the addition of all that champagne is just divine. Now this is a cake worthy of the new year! I love all your tips and tricks for infusing it with champagne flavor…even without the champagne! This cake is a masterpiece! Wow, this looks impressive, I’d love to have this as a dessert on NYE. All the champagne and sparkle!